WE are quickly approaching the middle of 2017, which means all of the leading television brands have announced the new products that will be available this year. If you're looking to upgrade and leaning towards something at the top end, there are plenty of options you to consider. The only problem is home entertainment brands love to try and win you over with lots of confusing marketing lingo and acronyms. To help simplify things, we've done the leg work to give you everything you need to know about buying a new 4K television. It's all about the detail. A 4K TV has enough pixels to fill four Full HD 1080p screens, which means it's able to display four times the level of detail. You will need an UHD Blu-ray DVD player or internet over 15 Mbps to stream content available in 4K, which is limited at this point in time. LG Signature OLED W7 TV sits flush against the wall. LG has long been considered the king of televisions and its 2017 OLED range is a good example of why. The hottest TV release of 2017 has been LG's Signature 4K OLED W series, which measures just 2.57-millimetres thick and weighs only 7.7kg. As organic light-emitting diode (OLED) technology doesn't require the same backlighting as LCD sets, it also allows for the razor-thin display. 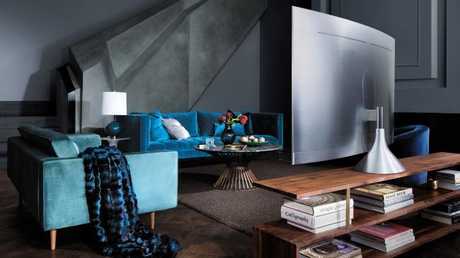 The "wallpaper" appearance of the 65-inch or 77-inch screen is helped by stripping all of the input ports from the television and putting them into a companion 4.2 channel LG Dolby Atmos soundbar, which will ship with every W-series. The soundbar includes four HDMI ports, three USB connections and an optical audio port and is connected to the television via a thin cable. With a price tag of $13,499, the W series is obviously not in everyone's price range. Thankfully, LG has a number of other cheaper models that are equally as impressive. Despite housing the hardware located at the rear of the TV, the OLEDs still keep the beautifully razor thin screens, which are narrower than a smartphone. And with the front screen and backing elegantly blending together to create a display free from bezel, watching the OLED in a dark room gives the appearance of a window into another world. Owning an OLED also comes with the difficult task of deciding which picture preset you use when watching content. LG supports various High Dynamic Range (HDR) formats for broadcast and other content - HDR is a technique that heightens the contrast between the brightest whites and the darkest blacks, which results in a more colourful and detailed picture. The most impressive feature of OLEDs is they are the only TV on the market to support Dolby Vision HDR and Dolby Atmos sound - the later built into every 2017 model in the range. By processing Dolby Vision's dynamic metadata within each frame, OLEDs are able to deliver a wide-colour-gamut - the largest amount of colours that can be physically displayed - for a refined, lifelike display like the director intended. Spot the difference. 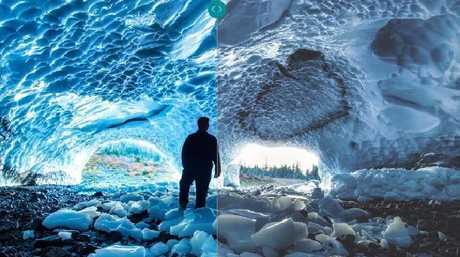 This comparison shows the detail and range of dark to light from Dolby Vision. OLEDs are able to offer fantastic viewing angles because there is no backlight to fight against, but this also means the TV can't reach the same brightness as its competitors. To keep the impressive visual quality of OLEDs in brightly lit rooms, a neutral black polariser has been added to the anti-reflection film - although some reflections are still present. The latest webOS smart system is easy to navigate and provides all location-appropriate apps like Netflix and Stan in a ribbon bar across the bottom of the screen. It is also possible to assign shortcuts to your favourite apps to a number on the remote control, which also allows for voice commands. LG's OLEDs are also the first TV capable of playing 360-degree Google VR videos. The panel life for OLEDs is around 30,000 hours, with LG claiming users can watch the TV for eight hours a day for 10 years. The company's OLED range starts from $4099 and come with three months free Netflix. Samsung QLED TV has almost no bezel and looks amazing. The main selling point of this one is Samsung's alloy coated Quantum Dot technology - tiny semiconductor particles around one billionth of a metre in diameter, engineered to emit light in its purest possible form. In short, this improves the TVs range of colours and better peak brightness - QLEDs can produce 100 per cent colour volume and have a brighter display than its competitors. Having a larger amount of colours that can be displayed and higher brightness means the TV has more realistic, accurate and vibrant images, in both bright and dark scenes. Samsung's Q8 and Q7 series is available in 55-inch, 65-inch, and 75-inch models, which come in either flat or curved screens, with the latter promoted as offering wider viewing angles. The top-tier Q9 will be available only with 65-inch, 75-inch, and 88-inch flat screen displays. In terms of viewing angles, QLEDs lose vibrancy and contrast when watching from an angle of more than 25-30 degrees - OLEDs outshines in this department. The use of edge-mounted backlights firing horizontally across the screen sometimes results in backlight clouding and grey banding when bright objects appear against dark backdrops. In terms of appearance, the display has almost no bezel around the screen and has a sleek all-metal design. A separate breakout box houses all of the ports you would expect on a television - HDMI, power, ethernet, USB, Antenna - to ensure there are no messy cables. Each of the different stands offered by Samsung also come with the ability to hide cables inside for a cleaner appearance. The TV's Tizen operating system has the ability for to automatically detect connected devices and display them in a clean ribbon bar on the bottom of the screen. Also located on the ribbon bar are all of the location-appropriate apps you would expect to come as standard on a 2017 device - think Netflix, Stan and YouTube. Another surprising feature is the TVs Spotify-esque ability to identify any song currently playing. Continuing its efforts to minimise clutter, Samsung's new range comes with a single remote that has the ability to control the TV and almost all connected media devices - it also includes dedicated Voice Recognition button. The TV itself also has downward firing speakers located on the bottom of the display and they offer more than enough quality for standard viewing. Samsung's QLED range starts from $4,499. 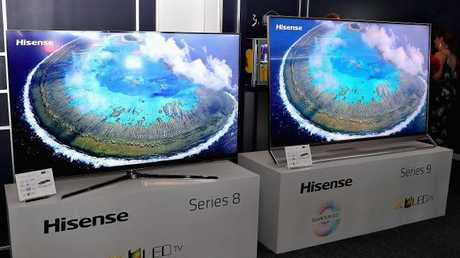 Hisense's new Series 8 and Series 9 TVs. ULED stands for Ultra Light Emitting Diode, a term referring to 17 different patented technologies with regard to colour, brightness, resolution and motion, that all come together to create a truly immersive and unique ultra high-definition viewing experience. By moving into the premium market, the Series 8 and 9 TVs offer a better viewing experience and sexier design - the things you would expect for the price range. Both models offers a sleek, industrial design with neat cable management and minimum bezel. As an improvement on the 2016 models, the range will boast "HDR Supreme" capabilities which provide a peak brightness of 1000 nits and improved colours. The more expensive 9 Series is also Hisense's first Australian offering to integrate Quantum Dot technology. Similar to the Samsung and LG models, Hisense's range has an easy-to-use interface, with pre-installed with services like Netflix, Stan and Freeview Plus located in a tidy ribbon display. The TV platform, known as VIDAA U, can also detect any external devices that are connected. Hisense's latest range starts from $2,999. The EZ1000 and EZ950 "Master OLED" displays are very similar, except the former has a 14-speaker 'sound blade' stand that works similar to a soundbar. Panasonic claim the EZ1000 offers the most accurate and detailed picture ever, with the OLED able to reach nearly 100 per cent of the DCI-P3 colour space - if accurate this would put it close to Samsung's QLED. The EZ1000 Series also features Panasonic's 'Absolute Black Filter', which reduces reflections to deliver precision and depth in challenging technical conditions such as off-black scenes with deep shadows which can look grey due to OLED's brightness. The range also offer the benefits of HDR multi-format capabilities and is fully compatible with HDR10 - a compulsory feature on UHD Blu-ray content that is also used by Netflix and Amazon Video. Furthermore, the unit has compatibility for the Hybrid Log Gamma HDR developed by the BBC, which is tipped to be the bedrock of future television broadcasting. All Panasonic's 2017 4K TVs feature the My Home Screen 2.0 interface, which is simple to navigate and can be easily customised. 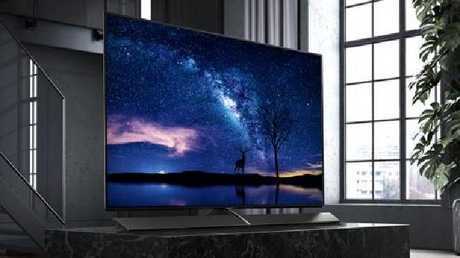 Panasonic's Master OLED range starts from $4,999. Sony Bravia X9300D 4K TV is nearly as thin as LG’s OLED. While thicker than LG's flagship, Sony's latest offering is still very, very thin. Unlike the competitors' models that have been designed to be wall mounted, the A1E comes with a specially designed stand that contains all of the components removed from the TV to achieve the thin display. 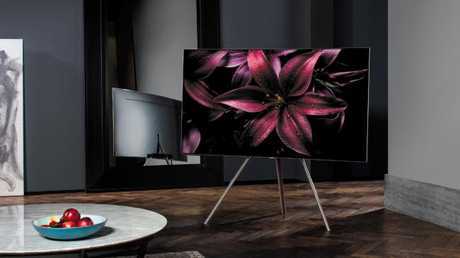 Appearance aside, the television also packs a real punch in terms of picture quality thanks to more than eight million self-illuminating pixels. The A1E series promises to offer an enriched visual experience with unprecedented black levels, and rich, lifelike colour. Another exciting component of the television is the fact two actuators on the back of the panel vibrate, making the display act as the speaker. 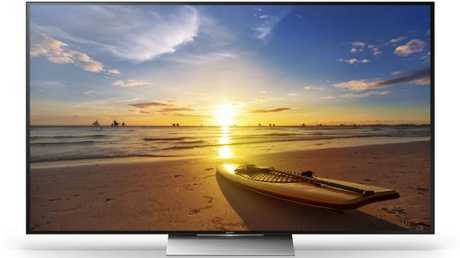 Sony's Bravia A1E is yet to have local pricing, but keep an eye out for updates. With a variety of price options, it's a matter of getting the best product you can afford. While there are lower priced 4K televisions on the market, it's wise to go with a trusted brand because they are likely to offer better picture quality, design and lifespan. Of all the TVs mentioned here, I have had the longest hands on with LG's OLED and Samsung's QLED range - and let's face it, they are both the market leaders. Based on my experiences, both offer amazing viewing experiences and different selling points. And while it's a tough decision, I would be more inclined to say LG's OLED is the best TV money can buy. I feel it has the best aesthetics, viewing angles and picture quality, plus it's the only product to offer both Dolby Vision and Dolby Atmos. What TV do you think looks best?